Home Uncategorized	Every One Of My Model Trains Appears In This Video! All twelve of the G-scale locomotives in my collection make an appearance in this video. 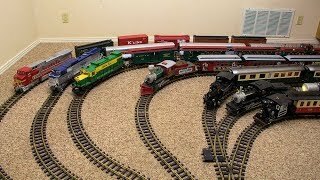 I created the biggest model train layout I’ve ever done inside my house, and had fun watching the trains run inside and outside of the house. If you watch the video with a pair of headphones on, you’ll hear some pretty cool stereo sound. Note the fairly amazing shot beginning at 11:35 in to the video. Thanks to the excellent “HyperSmooth” image stabilization of the new GoPro Hero 7 Black, I was able to get some incredible video of Thomas The Tank Engine flying down the track at high speed. It almost looks like it was shot from a drone flying alongside Thomas. Trivia fact: A wheel on one car of the Coca Cola train came off the track when it was just out of view of the camera at the 1:45 point in the video. If you listen closely, you can hear it on the audio track. 2nd Trivia fact: In order to fit all those trains in what is normally our dining room, I had to temporarily take apart and store the dining room table. You can see it at the 2:00 point in the video.